Have you got more than $5,500? Do you love Nintendo beyond all sense and reason? It's the ultimate prize for Nintendo NES devotees: the World Championship Cart, one of 90 grays issued in 1990 as part of Nintendo's bid to find the best gamers in the US. 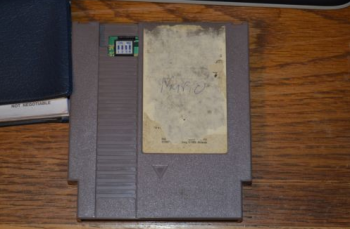 It's battered to hell and gone, and lacks the all-important unique number used to authenticate the cartridge; the label got ripped at some point in the dim and distant past. However the seller's confident that the official number can be unearthed if anyone really wants to try, and so far his eBay asking price - with a little over a day left on the clock at time of writing - is up to $5,500 and change. The cart should include a game comprised of a mash-up of Super Mario Bros., Tetris and Mad Racer. You couldn't lose Super Mario Bros. or Mad Racer, as the whole point of the competition was to get the highest possible score within a time limit, but Tetris could end prematurely, locking the player out until the limit was up. The greys were handed out to the semi-finalists, while the ultra-rare gold carts - of which there were only 26 made - weren't part of the competition, and were handed out as a Nintendo Power promotion. The vendor says it plays just fine, and could be worth a lot more than the asking price if the identification number could be verified. It's part of a collection he's spent 25 years building up, and now's the time to liquidate it. This battered grey cart isn't quite what you'd call a collector's dream - it's far from mint condition - but, for serious Nintendo fans, something like this is a serious temptation.